It has been called a quiet revolution. A renaissance. And Western North Carolina is smack in the middle of it. With five distilleries opening in the last two years, our region is keeping stride with a national craft liquor trend. But maybe not. North Carolina has endured a love-hate relationship with alcohol that dates back to the early days of the republic. From the Whiskey Rebellion of 1791 to the bootleg era of the 20th century, the state has vacillated between wet and dry, legal and illegal. Even after Prohibition ran its course in 1933, homemade liquor remained a thriving industry. To the moonshiners, it was more than a business; it was a way of life. Today, a new generation of distillers is bringing a fresh perspective and commitment to the tradition, albeit on the right side of the law. Whether you prefer white lightning, brandy, gin, or single malt whiskey, you can find a locally made liquor to fill your glass or blend a favorite cocktail. Here’s your chance to get to know the committed and ambitious folks putting spirits back in the mountains. Howling Moon distills its whiskey in a modest building just north of Asheville. Bradford and his cousin, Chivous Downey, released their white lightning in February and already anticipate a move to bigger digs. The cousins, in their 20s, constitute the entire staff at Howling Moon. Entrepreneurs in baseball caps and T-shirts, they take on every job, from unloading sacks of corn to bottling the final product. And just as they went with an old-time recipe, they stuck with the old methods, from the homemade still to the corn ground at a local water wheel. “My family has been making moonshine for 150 years,” Bradford says. “My father wanted to teach me how, but I was afraid of taking the risk.” But when he got tired of traveling for his job with a nursing home service, he decided to take the leap. Available at ABC stores in North Carolina. Troy & Sons could be called the mother of Western North Carolina craft whiskey—in more ways than one. 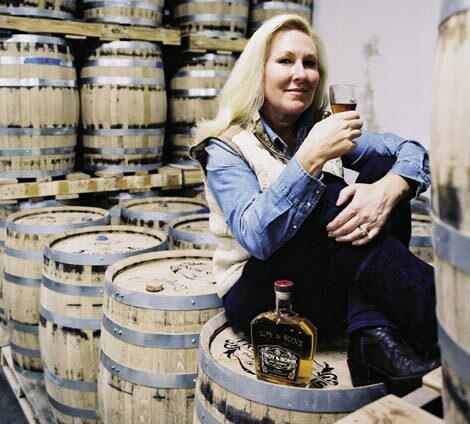 It’s the largest of the region’s five distilleries, shipping about 10,000 bottles a month, and founder Troy Ball proudly acknowledges that she is the only female owner of a whiskey distillery in the country. In all honesty, the company is truly a family affair; Charlie Ball, Troy’s husband, is the master distiller. The spacious, modern distillery in a former Southern Railways warehouse on Asheville’s eastside features a polished copper, 2,000-liter still. Soon it will be dwarfed by a mammoth 5,000-liter model on the way from Germany—the largest still ever built by the Kothe company. In the back, pallets are stacked high with cases of whiskey shrink-wrapped and ready to go. Troy & Sons’ first delivery was in August 2011, and in just more than a year, the company has added two new products. In addition to the original Platinum moonshine, the Oak Reserve whiskey, which is aged one year, was released in August. Currently in the barrels, the Blonde Whiskey, a blend of corn and rare turkey red wheat, is scheduled to debut early next year. As the company’s lineup is expanding, so is the market. Mixologists across the region are making Troy & Sons a standard on shelves and in their cocktails, and the products have recently been added to the bar at the upscale Wilderness Lodge at Disney World. This fall, the mom of three boys will make her second trip to China with a delegation of distillers and brewers looking to enter the market there. Troy took her first sip of true, corn-based moonshine in 2008. The sugary blends she’d tasted in the past paled in comparison, and she decided it was time someone started (legally) producing the real deal in the mountains. Troy found an old-time moonshiner who agreed to show her how it’s done and then another in Alabama who allowed her to record his process. Blue Ridge Distilling Company is hidden behind a grassy bank on a twisting dirt road in Golden Valley, outside the small community of Bostic. 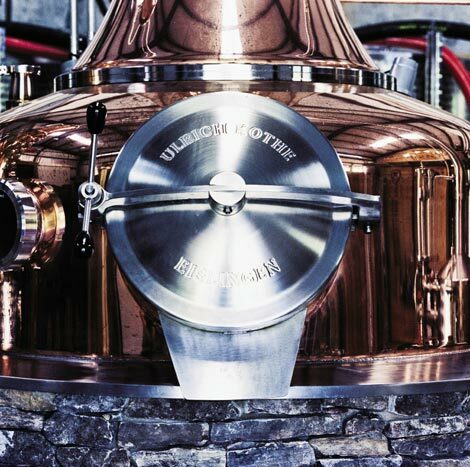 One look at the spacious distillery, with its gleaming copper still and seven stainless steel fermenting tanks, and any reservations about Ferris’ elaborate ambitions begin to dissolve. When construction began on the enormous shed, it was meant to house equipment for his international salvage diving company, which reclaims everything from sunken oil tankers to superstructure cargo ships. In one afternoon, after the foundation was laid, the direction changed and the plan for the distillery was born. Ferris and friends had tossed around the idea of opening just such an operation. 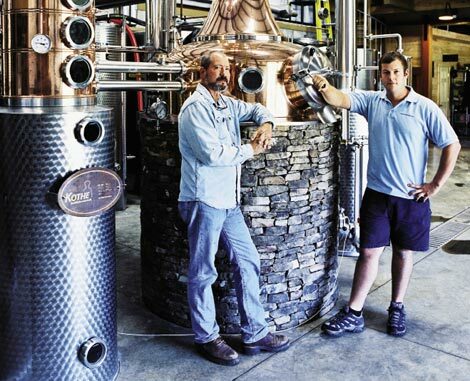 “The diving business takes us all over the world, and when we’d finish a big job we’d treat ourselves to the best whiskey we could find,” says Ferris. “I got interested in single malts, and eventually had to give it a try.” Today, a few of the company’s longtime divers comprise the distillery’s staff. Now they have a product they call “the good stuff,” which Blue Ridge Distilling hopes to have in stores early next year. “Based on the feedback, I think we’ve got something special,” Ferris says. Cardinal Gin was a hit almost immediately. Less than two years after its first case was shipped, Southern Artisan Spirits had produced the only gin in the United States to win double gold medals at the San Francisco World Spirits Competition, beating out a host of well-established brands (even some of the big guys in London). Not too shabby for some boys from Kings Mountain, the first community in the country to vote itself dry. Though the company is a family operation, it isn’t a mom-and-pop establishment. A better term would be, twins and pop. 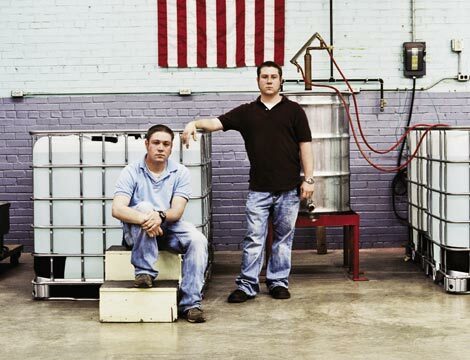 Thirty-one-year-old brothers Charlie and Alex Mauney started by making wine in a garage. But when Alex, who was working in chemical energy, let law student Charlie know he was pondering opening a distillery, they went through the complicated permit process and then got to work on recipes. They eventually found their way to a layered, modern style of gin, which isn’t quite as heavy on the juniper berries. “Most gins have five or six botanicals,” Charlie explains. “We include 11.” The brothers quickly list such flavors as spearmint, clove, and grains of paradise, which are all organic. Now their distillery occupies an old, family-owned warehouse about 30 miles west of Charlotte. The building leaves them plenty of room to grow, and as the name of the company implies, there is more to come from the brothers. 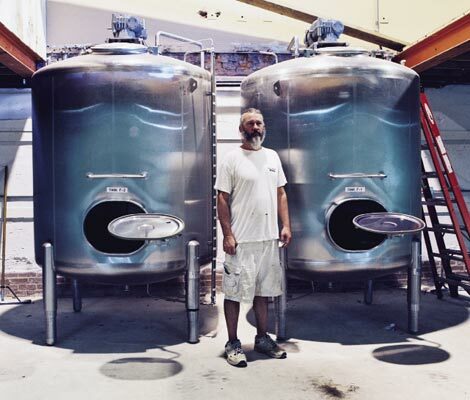 They’re already working on a rye whiskey and a bourbon they hope to have out by the holidays. Georgia, New Jersey, South Carolina, and Virginia, and soon in Washington, D.C. 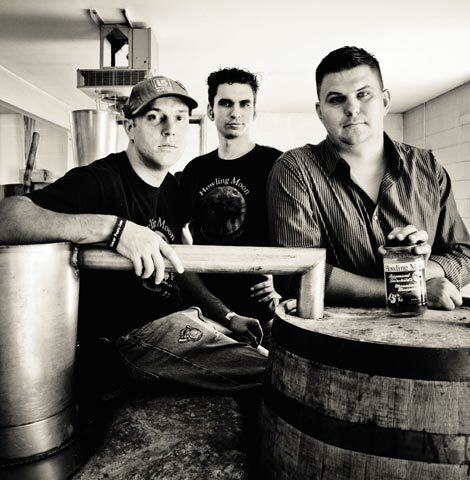 The award-winning recipe is the work of another founder of the company, master distiller Chris Hollifield, whose family tree includes a long line of moonshiners. “One of them was in jail at all times,” jokes Nordan. In that tradition, Carolina Distillery recently came out with Strawberry Infusion apple brandy, which contains 20 percent fresh strawberries. The combination results in a complex flavor that’s not too sweet or heavy. Carriage House relies on Perry Lowe Orchard in Wilkes County for its apples, with a supply that generally keeps them in production from September through May. That frees up the summers to take care of the details of running a thriving business, which Nordan sees as the hardest part of his job. “The intricacies of business and the various government regulations can be frustrating,” he says, noting that it took nine months to get the initial federal distillery permit. But he says it’s worth the trouble. The guys, including the third cofounder Kenneth Greene, plan to launch at least one new liquor a year for the next five years. The new distillery, slated to open in early 2013, will offer tours, tastings, and a gift shop. With the emergence of a craft liquor industry in WNC, take the time to get familiar with some common terms so you can order a drink with confidence. Liquor is the ultimate catch-all, defined as an alcoholic beverage produced by distilling fermented grain, fruit, or vegetables. This excludes beer and wine, which are fermented but not distilled. Whiskey is another catch-all word, but not as broad as liquor. It describes fermented alcoholic drinks made of grain mash, including barley, malted barley, rye, wheat and corn, but not fruit or vegetables. Whiskey is often aged, in which case it gets its color and additional flavors from the wood barrels. Gin is a white spirit flavored with juniper berries and an assortment of herbs and spices. The base is usually wheat or rye. Moonshine is a clear whiskey made using corn as its primary ingredient. Sugar, yeast, and other secondary ingredients may be added. One reason moonshine became so popular as an illegal drink is because it’s relatively easy to make. Family recipes are guarded secrets, but in general it’s simply a matter of mixing and cooking. Mix corn, sugar, yeast, and malt in a large container of water. Let it ferment for a couple of days, before transferring the mash into a copper still. Heat until the alcohol vaporizes, transfer the vapor to an empty container, and let it condense back into liquid form. From start to finish, the process takes about a week. Single Malt Whiskey is distilled from one malted grain, usually barley or rye. Yeast and water are the only other essentials. The distillation process is more complicated and time-consuming than making moonshine. Whiskey is aged in barrels before the product is bottled. Fruit Brandy is distilled from fruit itself; it’s not merely a matter of adding flavoring to the mix. It became part of moonshiners’ repertoire when they ran short on corn.